4.The red wire connects to the reversing lamp. 5.One video cable can connect the backup camera to the rear view mirror monitor. *Decent backup camera with waterproof and night vision. ORIGINAL EQUIPMENT LOOK:Perfectly matching the vehicle body just like any parts of your car. 4 mirror's bracket adapters are included. PARK SAFELY & EFFORTLESSLY: It will automatically show the parking image without pressing any buttons when the R gear is engaged. WATERPROOF IP68 & NIGHT VISION: No worry about fog or mist inside the camera even in rainy days. Night vision thanks to the digital high-definition image processor and 6 LED lights. 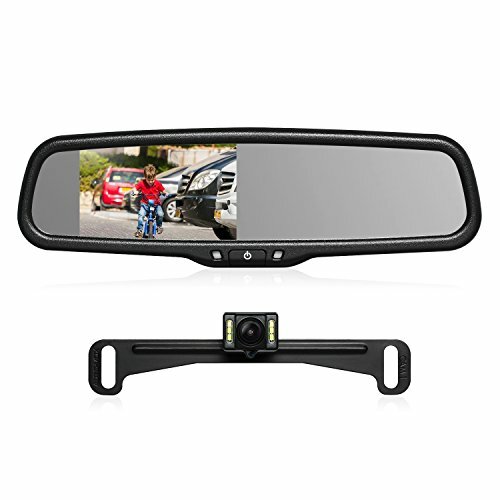 HIGH COMPATIBILITY: This rear view mirror is suitable for most car models like Toyota Honda Nissan Mazda Hyundai Kia Ford Pickup etc.